DEAR JERRY: Novelty collector that I am, I bought Larry Verne's "Mr. Custer" when I first heard it, though I never thought something so offbeat would reach No. 1. A year or so later, when I upgraded my worn original, I noticed a big difference between the two. Both have the same black label with silver print (Era 3024), but my first one credits Al Duval, Cal Rogers, and Marc Fredericks as the writers. The second copy lists F. Darian, A. Delory, and J. VanWinkle as writers. Why did they completely change the writers? Were they merely correcting a blunder from the first pressings? Is there a value difference? DEAR SHAWN: There was no mistake, and the writers didn't change. But their names did. The switcheroo came about because a BMI executive in their Los Angeles office became curious enough to investigate the matter. Look again at the two labels and you will see the first issue shows the publisher of "Mr. Custer" as Bamboo Music, Inc., affiliated with BMI. The second one lists Pattern Music, a publisher represented by ASCAP. Writers and publishers, who are often one and the same, have the option to place a song with either or neither of the collection organizations BMI and ASCAP, but not simultaneously with both. Unless of course you come up with different names and manage to stay under the radar. In the 1940s and '50s, quite a few ASCAP members also wrote for BMI under aliases in order to obtain performance fees and sales royalties from both firms — an unethical tactic, but not a criminal offense. Due to changes in ASCAP's logging system, the appeal for writers to be in two stables at once faded in the early '60s. In January 1960, ASCAP writers Fred Darian, Al De Lory, and John VanWinkle joined BMI using the names Cal Rogers, Al Duval, and Marc Fredericks. Not until the release of "Mr. Custer" (August 1960), and its immediate exposure and sales, did BMI learn the truth. Whether Era Records knew the whole story is not known, but they did switch to the Pattern Music/ASCAP label, the one with the writers' real names. There is of course a difference in values, with the first Era pressing at about $25 and the second around $15. DEAR JERRY: After seeing ABBA night on the "X Factor" singing competition show, I started gathering as many of their originals as possible. Though their peak years predate me, I really love ABBA. Since I can't tell the female voices apart, I'm hoping you can identify which one is singing lead, that is of course when they are not singing together. Since it's nearly that time, please begin with "Happy New Year." I recall you once answered this type of question regarding the Beatles. DEAR COURTNEY: When it comes to knowing whether it is blonde Agnetha (sounds like Ann-Yetta) or brunette Anni-Frid ("Frida") as the featured soloist, you are not the only flummoxed fan. 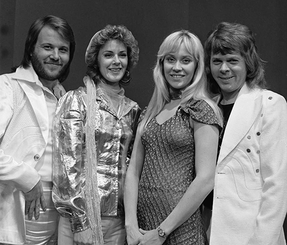 The similarities are effectively showcased on "The Way Old Friends Do," a live recording on their "Super Trouper" album, taken from a 1979 London concert. This poignant ballad begins with Frida singing the first verse and Agnetha taking the second. Still, unless you're watching the video you probably wouldn't realize those lines are not all just one voice. The girls do harmonize on much of "Happy New Year," but the solo segments are Agnetha's. One tune without mystery is "Thank You for the Music," wherein Agnetha conveniently identifies herself thusly: "I am the girl with golden hair." Among others featuring Agnetha are: "The Winner Takes It All"; "Chiquitita"; "Gimme, Gimme, Gimme (A Man After Midnight)"; "S.O.S. "; "Take a Chance on Me"; "Kisses of Fire"; and the wonderful and often overlooked "Hasta Manana." Examples of Frida's solos include: "Super Trouper"; "Fernando"; "Knowing Me, Knowing You"; "I Have a Dream"; "I Wonder"; "Money Money Money"; and "Rock'n Roll Band." According to Frida, she is a mezzo-soprano and Agnetha, with a slightly higher voice, is a soprano. IZ ZAT SO? Worldwide sales of ABBA (Agnetha - Bjorn - Benny - Anni-Frid) recordings increase by at least a million each year. Current estimates put sales at around 375 million units. They are easily among the top-selling artists of all time. The musical "Mamma Mia," based on the songs of ABBA, is the world's most popular stage show, having been seen by over than 42 million people. Michael G, from Burke, VA is the winner of the Rachael Sage LP contest. The winner of the Harrison contest will be posted as soon as I hear back from him.